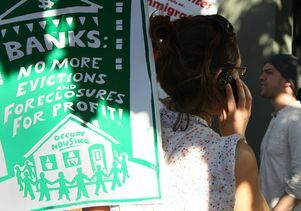 UCLA law professor Gary Blasi studied outcomes for tenants facing exorbitant rent increases who fought eviction without legal help. In 151 randomly sampled cases, the tenants lost every time. Even if a tenant were to mount a winning defense, a landlord could endlessly refile until the tenant throws in the towel. The broader Bay Area is the most robust metro region in the nation in terms of payroll job growth, according to the most recent regional analysis from the University of California-Los Angeles Anderson Forecast, an economic forecaster. Only 48 percent of students from a racial minority at the University of California-Los Angeles continued studying STEM courses through their senior year of college, compared with 74 percent of white students, according to a 2017 study from the university’s Higher Education Research Institute. “The idea that the gravity from these very distant bodies affects our lives in some way just doesn’t work in the framework of physics,” Jean-Luc Margot, a planetary astronomer and professor at UCLA, told LiveScience back in 2016. Dr. Gregg Fonarow is director of the Ahmanson-UCLA Cardiomyopathy Center. He wasn’t connected to the study. “These findings suggest that it is the total physical activity that is accumulated that matters, aiming for 150 minutes a week total, whether divided up into short duration more frequently or longer bouts of exercise,” Fonarow said. Cancer immunotherapies that trigger a person’s own immune system to recognize and attack cancer cells have logged some success in certain patients and with certain types of cancers. “But overall that is a minority of cancer patients,” says Antoni Ribas from the University of California, Los Angeles. The JUUL is a compact, USB-shaped vaping device. In most respects, it isn’t much different from most other e-cigarettes, says cardiologist Holly Middlekauff, M.D., professor of medicine and physiology at the David Geffen School of Medicine at UCLA. “The liquid is pretty much the same. It has solvents, nicotine, and flavorings,” Middlekauff told MensHealth.com. The solvents help deliver the nicotine and flavors in the form of tiny particles into the lungs.